Since the 1980s, Malaysia’s manufacturing sector has been spearheading the country’s economic growth with its contribution to the national GDP quickly surpassing that of the agricultural sector. The share of the agricultural sector in the GDP thus dropped sharply from 29.9% in 1970 to 18.7% in 1990, and reached 8.9% in 2015. Furthermore, the value-added and the productivity of the Malaysian agricultural sector has failed to keep up with that of the non-agricultural sector. Currently, the manufacturing and services sectors are no doubt the main engines of growth for Malaysia, but at the same time, the economy needs to diversify its sources of growth to improve its revenue stability. In other words, the country needs balanced growth across the agriculture and industrial sectors. The imbalance between these sectors can become an obstacle to sustainable industrialisation. Most importantly, the increasing negative balance of trade in food has become a critical area of concern for the government. Among all the agricultural sub-sectors, it is the aquaculture sector that is expected to play an important role through generating higher export revenues. Special emphasis has been given to the development of aquaculture industry as a high value activity in the National Agro-Food Policy (NAFP) (2011-2020), and it is projected that the industry is already witnessing a growth that will see it grow by 8.6% between 2011 and 2020. Although fisheries contribute only 10.7% to the agriculture sector and less than 1.5% to the national GDP, it is still an important component of the economy of the country, providing employment for millions of people, especially in rural communities. It also tackles poverty among coastal communities and contributes about 44% of the total animal-sourced protein intake, particularly of the poorer classes (Figure 1). Fisheries therefore contribute to food and nutrition security, employment, and national economic growth. In line with population growth as well as increases in consumption of animal protein associated with changes in lifestyle and rising incomes, demand for aquatic food products is expected to increase. Future scenarios, however, show that production from marine-capture fisheries on the west coast of Peninsular Malaysia may become unreliable since many fish stocks have been over-exploited. Recognising this, various means of increasing production through aquaculture are now being explored. Indeed, aquaculture sector is potentially the source to meet future demand for fish. Employment in fishing and aquaculture in Penang has grown rapidly over the past decades, expanding annually by 6.4% between 2006 and 2014 (Figure 2). This growth has been most pronounced in marine-capture fisheries. In 2014, the sector provided direct employment to 8,009 fishermen and 592 culturists. However, the number of fishermen working on licensed fishing vessels in 2015 dropped drastically by about 30% due to restrictions on the issuance of fishing vessel licenses to control over-fishing. 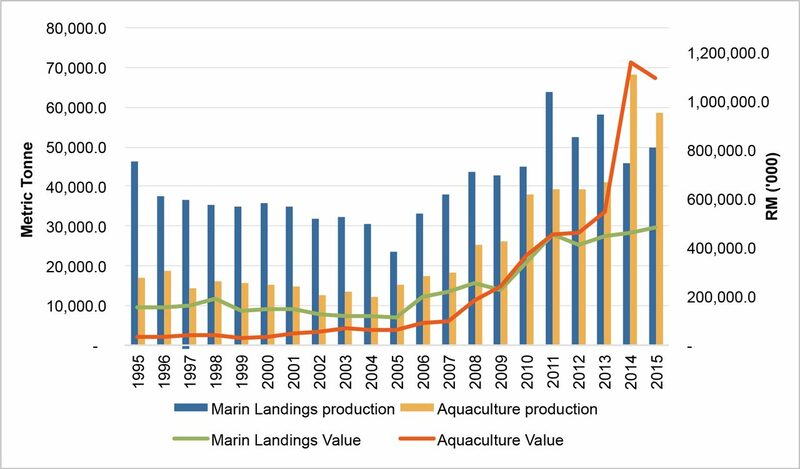 Between 1995 and 2015, aquaculture fisheries in Penang showed a remarkable average annual growth rate of 8.2% and 23% in production and value respectively, while marine-capture fisheries experienced a slower growth rate of 1.7% and 8% in quantity and value respectively (Figure 3). Unsurprisingly, the percentage contribution of aquaculture to total fish production is increasing. In 2015, the food fish sector, which consists of marine-capture fisheries, aquaculture fisheries and inland fisheries, produced a total of 108,550.01 metric tonnes, valued at RM1,573.6mil. Domestic demand for fish however continues to exceed local supply. Penang’s food fish production showed the second highest wholesale value in the country, with aquaculture contributing over 54% to the state’s food fish production (58,736 metric tonnes valued at RM1,090.6mil); while marine-capture fisheries contributed nearly 46% (49,783 metric tonnes valued at RM482.2mil) and production from inland fisheries contributed under 0.03% of the total. Source: Department of Fisheries, Malaysia. Penang’s aquaculture industry has therefore excellent potential for cultivating fish and seafood products for domestic and external consumption. The state is currently the second largest producer of aquaculture products in the country after Sabah and the fish farming industry can indeed become a major driving force in enhancing the economy of the state. In 2015, Penang’s aquaculture production gained the highest wholesale value in the country. Brackish water ponds and cages constitute the majority of Penang’s aquaculture and have the highest number of culturists (Figure 4). Fisheries from brackish water have been contributing nearly 50% of the total fish production and about 69% of its value in Penang. Of these, sea bass and snapper recorded the highest production, followed by shrimp, cockle and other brackish water cages species, such as grouper and mackerel. 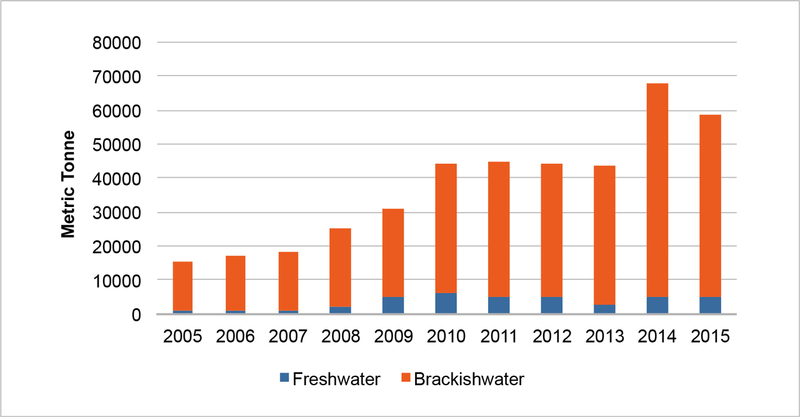 Shrimp culture in brackish water pond contributes most in terms of value. Penang is the second highest producer of shrimp in the country after Sabah and gained the highest wholesale value for shrimp-production in the country. In 2015, Penang produced 10,477.62 metric tonne of Hawaiian white shrimp worth RM268.970mil. In fact, shrimp aquaculture is a high-income venture for farmers and has an export value that is high enough to be significant for the overall economy of the state. Returns from shrimp aquaculture can be forecasted in advance and provide farmers with a higher and more stable income than fishing or other agricultural activities such as rice farming and oil palm plantation can do. However, unplanned and unsustainable development of shrimp farms does have environmental costs in terms of destruction of natural habitats and displacement of traditional livelihoods. Hence, organic aquaculture practices and effective management practices are advisable in enhancing the sustainable development of shrimp farming. Being rich in natural mudflats Penang is also a suitable breeding area for cockles. Penang is the third largest cockle producer in the country, behind Perak and Selangor. Cockle culture is the fourth largest income earner in the state’s aquaculture industry. In the non-food fish sector, ornamental fish is the main contributor, achieving a value of approximately RM26 mil in 2015. Penang is globally known as one of the largest centres for the breeding and export of different domesticated strains of Discus fish. Despite its current successes, the aquaculture industry faces a number of serious challenges. One of these is the high production cost, made heavy by a dependence on imported feed. Pollution and low water quality have led to an increase in incidents of disease which cause a lot of damage to the fish farms and reduce the economic returns of the fisheries industry as a whole. For instance, in 2015, the production of cockles dropped by a dramatic 78% – mostly due to water pollution. Environmental change is another important issue that influences the quality and quantity of aquaculture production. In 2015, there was severe water stress in Penang caused by the El Nino phenomenon which affected the overall production. Fluctuations in water temperature and annual rainfall, and the unpredictable shift of rainy and dry seasons have strong bearing on the physiological, ecological, and operational aspects of aquaculture activities. These have been major causes of failure in pond aquaculture production, particularly of shrimps. Labour shortage is also a serious factor in the aquaculture sector. With sustained industrialisation in the state, this factor has remained a constraint on the sector’s growth. Since local youths prefer working in factories for the higher returns, aquaculture has had to rely heavily on foreign workers. This indirectly leads to a loss in foreign exchange. One way to overcome the problem is to narrow down the wage gap between the aquaculture sector and other economic sectors, especially manufacturing. For instance, expansion and commercialisation of agro-based industries in rural areas would attract the younger generations. Even though fish farming is a prevalent solution to the over-exploitation of stocks and destruction of marine habitats, some forms of aquaculture create new problems such as ecological damage and water pollution. Economically viable aquaculture requires high-value fish. However, high-value fish tend not to be environmentally sustainable. Hence, the critical challenge is to develop an ecologically sound and economically viable aquaculture model. In spite of the important contributions that fisheries and aquaculture make to nutrition, employment and trade, their economic value has not fully been tapped. This is likely due to problems in the evaluation of small-scale fisheries. Data are not easily available. In fact, the number of people who depend on fisheries and aquaculture for their livelihoods is probably greatly underestimated, along with the sector’s actual contribution to development. Aquaculture industry has multi-functional roles: As a matrix of development in ensuring food supply, to assisting economic growth, and in preserving rural communities. The importance of fish and fishery-based activities to food security is most prominent in communities engaging in small- to medium-scale operations. This not only affects their consumption of fish, but also their income. The aquaculture sector is often responsible for substantial multiplier effects on economic development, through supporting the growth of other industries and sectors, particularly the food processing industry. The availability of locally-sourced fish would help lower costs of production and provide for better sustainability. Besides, aquaculture development would have cumulative effects on the agriculture and tourism sectors. Indeed, integrated agriculture-aquaculture systems would enhance farm efficiency and sustainability. For instance, fish farming in rice fields or rice-fish culture contributes to integrated pest management as well as increased farm income. Moreover, water from ponds provide storage reservoirs for irrigation and livestock during water shortages. Aquaculture centres also have the potential of becoming attractions for foreign tourists and students of various types, providing them with a chance of experiencing breeding fishes at first hand. Penang has the potential to further increase supply to meet domestic and export demand. In fact, the state is poised to be a huge fish exporter in the region, because of its closeness to the Indian Ocean and its well-developed port and airport cargo transport facilities for shipping to main East Asian markets. Moreover, since Penang is a major transportation and logistics hub in the northern region and the Indonesia-Thailand-Malaysia triangle, it facilitates farmers in gaining access to the global market. While aquaculture offers an alternative to over-fishing, many aspects of aquaculture require enhanced scientific knowledge and technological advancement to become a sustainable source of food production and income generator. Design and construction of commercial fish bases, research and development (R&D), provision of better services to farmers, and intensive and high-yield aquaculture technologies can all lead to a rapid increase in production and income. The state has the potential to become a centre for aquaculture R&D and produce high value-added fish and fish-based products because of the concentration of research facilities and world-renowned research institutes located there such as the Worldfish Centre, the Fisheries Research Institute, and the marine biology research programme of Universiti Sains Malaysia (USM). Moving towards a sustainable future not only requires innovative thinking but also global knowledge. While recognising aquaculture as one of the thrust areas for economic growth, the impact of aquaculture on coastal ecosystems as well as socio-economic linkages in rural communities needs to be studied. Land-based production system, in pond or tank, should be a means of production in the future as environmental issues may no longer permit waterways to be used for cage operation. Kharas, H., Zeufack, A., & Majeed, H. (2010). Cities, people, and the economy: A study on positioning Penang. Khazanah Nasional and the World Bank. Handisyde, N. T., Ross, L. G., Badjeck, M. C., & Allison, E. H. (2006). The effects of climate change on world aquaculture: a global perspective. Aquaculture and Fish Genetics Research Programme, Stirling Institute of Aquaculture. Final Technical Report, DFID, Stirling. 151pp. Previous PostPrevious Chinese Property Projects in Southern Johor: Should We Be Concerned? Next PostNext Logging in Ulu Muda Forest Reserve: Is Penang’s Water Security under Threat?